A person who doens't know Arezzo and who would find himself in the Saint Francis Square of this art city of Tuscany could never imagine that here, beside the unfinished and coarse facade of Saint Francis Church, which became a basilica in 1955, some paintings of such important artistic value could be found; paintings that this web section will show us and allow us to see on-site. Pier Della Francesca's frescos cycle, which illustrates the "Legend of the True Cross", certanly is the crown-jewel of this pictorial heritage. 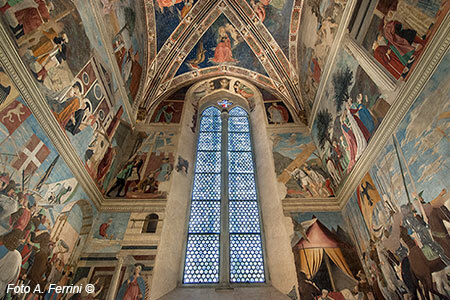 They were painted between 1452 and 1466 to decorate the main chapel of the church placed behind the high altar, the Bacci Chapel, which is named after the rich family of merchants from Arezzo that commissioned this work to the great artist from Biturgi. However, Pier Della Francesca's paintings are not the only ones that give splendor to this sacred building. 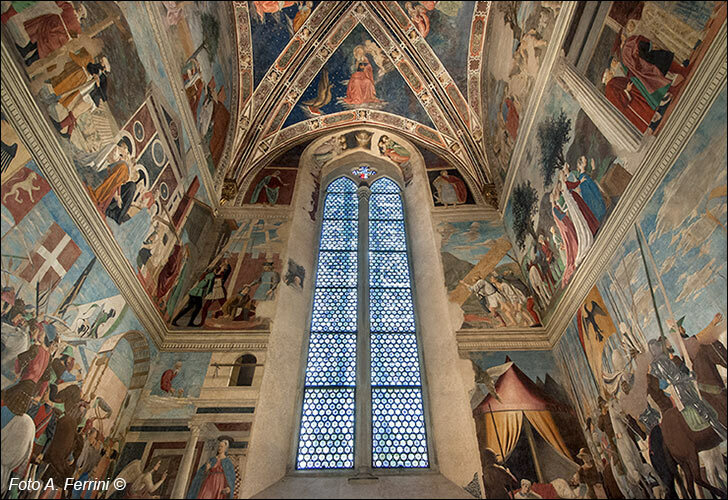 Its walls were once completely covered with paintings dating back from the second half of the 14th century to the full 15th century, accomplished by famous masters from Arezzo and other places, such as Spinello Aretino. Nowadays, many of these works have gone lost, while others are just partially visible. 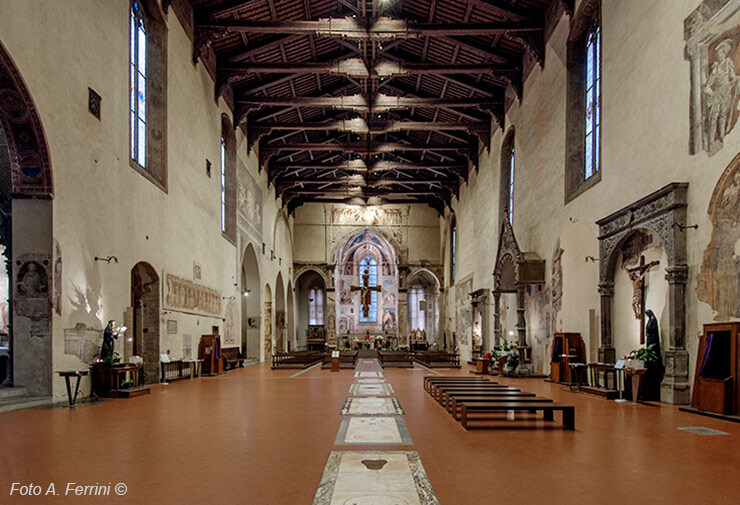 In spite of this, the Basilica of Saint Francis is the church that shows, both quantitatively and qualitatively, the greatest artistic asset in Arezzo in regard to frescos. In the second half of the 13th century Saint Francis' notoriety in Arezzo increased exponentially, as well as did his followers, after he had received the Stigmata in 1224 in the near Verna mount and had been canonized in 1228, only two years after his death. During that period in La Verna and Poppi the counts Guidi had the Chapel of the Stigmata and the Church of Certomondo built; while, in Arezzo the famous painter Margherito accomplished an extraordinary representation of the Saint, which is nowadays conserved in the National Museum of Medieval and Modern Art; in addition, the Poor Man of Assisi's fellow friars started being more and more present in the city, so much that around 1290 they began the construction of the building that throughout the 14th century became, with the overlapping of several restorations, in the basic structure of single nave, the one that today is the church of Saint Francis in Arezzo. Its facade, rebuilt in 1346, was never finished. Drafts of works for the completion of the structure are clearly visible on the outside. Due to the period in which the church was constructed, it "developed" a light Gothic style. However, during the centuries, the many reconstructions have changed it several times. In 1556, it underwent a disastrous fire inside, and for the one that until that moment had been an architectural and artistic magnificence, it started a long and unstoppable period of decay. It culminated with the Napoleonic period and the following 19th century when this church was closed to worship and also transformed into a warehouse. In the early 20th century, the church underwent some restoration works regarding both the architecture and the paintings, and, as soon as accessible, was re-opened to worship. The architect Umberto Tavanti (to whom is dedicated one of the chapels) who, director of the works, had several parts rebuilt in the style of the 15th century: this is the reason today the Basilica of Saint Francis in Arezzo appears with an aspect resembling the Neo-Renaissance one. The Church of Saint Francis, while remaining a place of worship, is nowadays also a state museum.